Scott Lord is looking to break our I-swept-the-previous-week-but-lost-the-following-Monday streak, which stands at four. For the third time in his six games, he’s going to need some help. If Scott doubles his score, he’ll have 16,000. 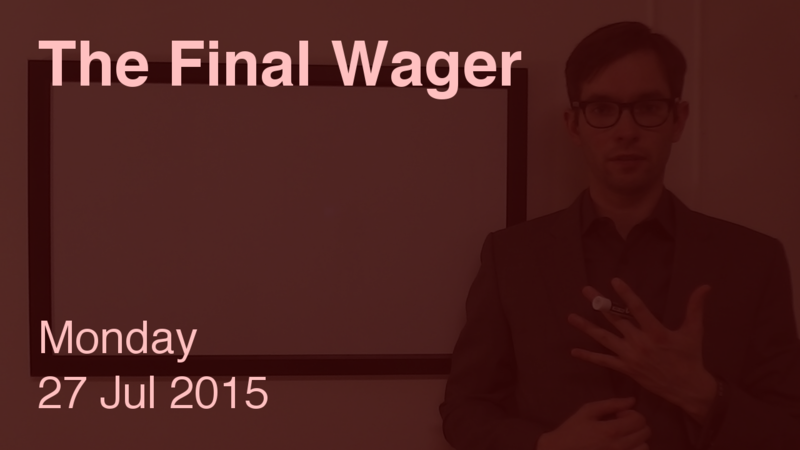 To cover this all-in wager, Suzanne will need to wager 3,200. An incorrect response with that wager will leave Suzanne with 9,600. A successful doubling will put Luke at 8,000. Suzanne could wager at most 4,800. Poor Scott! He almost had the right response. Alas, five victories and over $100k will have to do… until the next TOC rolls around, anyway.